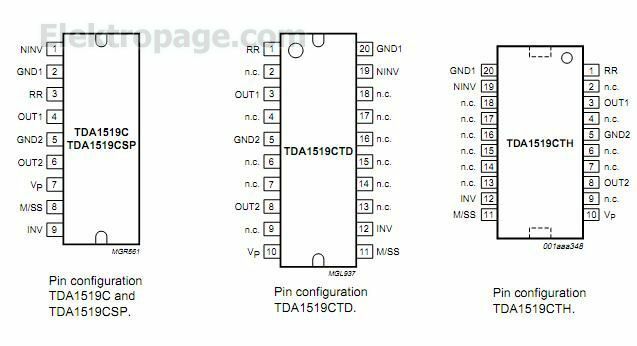 The TDA1519C is an integrated class-B dual output amplifier in a 9-lead plastic single in-line power package or 20-lead heatsink small outline package. For the TDA1519CTH (SOT418-3), the heatsink is positioned on top of the package, which allows an external heatsink to be mounted on top. The heatsink of the TDA1519CTD (SOT397-1) is facing the PCB, allowing the heatsink to be soldered onto the copper area of the PCB.